Riot Games have finally released the highly anticipated Dominion mode for their free-to-play title League of Legends earlier this week, unleashing it for the community after a period of time-restricted beta testing the week before. Needless to say, it's a much needed twist on the multiplayer online battle arena game "“ the only fresh piece of content fans have seen since its release have been new champions, now we have both a new map and game mode! For the fledglings looking for a free online game to try out, League of Legends is categorized under the multiplayer online battle arena genre "“ or MOBA for short. Like it's inspiration (Defense of the Ancients), players are tasked with taking down enemy towers and eventually claiming the enemy base. Dominion takes that concept and adds a twist normally seen in first person shooters and real-time strategy titles: king of the hill. The map is dotted with capture points that players have to capture, rather than destroy. The premise is simple, hold more capture points than your enemy and the health points for their Nexus will slowly decline. It's a much faster paced experience than the traditional escapade. Now it's important to note that League of Legends isn't a very fast experience. It's intense for sure, but in a more methodical way. Players slowly build up their champions as they hold the fort, preventing enemies from taking their towers while at the same time attempting to take the theirs. Dominion, on the other hand, turns this experience on its head. So, the games kick off with every champion starting at Level 3, enabling them to level up all of their spells and abilities save for their ultimate. The mode is set on a circular map with capture points lining the parameter in a pentagonal shape. Strategic points are usually the Windmill up top and either the Boneyard or the Quarry down below, depending on which side you're on. Of course, you can be the sneaky bugger and try to backdoor the enemy and claim The Drill or The Refinery, forcing their focus away from the other capture points, allowing your team to claim them. Minions are still around, although they don't play as important a role in Dominion. Capturing points is a much more important task, with players earning points for capturing and defending them. Points are also awarded for Champion kills and assists. Honestly, it's not inaccurate to compare the experience to a game of Conquest in Battlefield. On top of capturing and defending points, Riot's thrown in dynamic quests that challenge you to change your course of action to claim an objective on the fly, rewarding successful players with goods as well as damaging the enemy Nexus. Trying it for the first time during its beta testing phase, I heard several things about the mode, such as tank class champions being the most proficient type to play, which is quite subjective seeing as Vayne has attack speed on her side and is very, very good at harassing any enemy champions away from our capture points. Anyway, that's a bit of a digression. Taking up Rammus and going with the tank build, the hearsay mentioned proved relatively true. One particular thing to note with Rammus is that he has speed on his side in addition to being quite a good tank. In hindsight, Rammus is the perfect champion to quickly capture the Windmill point. With Boots of Mobility that add an additional 2 Movement Points and another 3 when not in battle, couple that with his Power Ball ability and the speed booster just by The Drill and your opponents will be hard-pressed to beat you to the Windmill. Unfortunately, I wasn't privy to this knowledge until observing other players, but you live and learn. 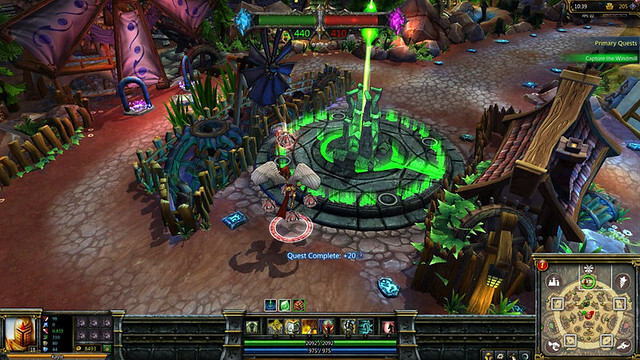 Capturing a point sounds like a totally simple concept, but when turrets and enemy champions are thrown in alongside the steady decrease of your Nexus' health points should you lose the majority share of capture points and Dominion turns League of Legends into an intense and super fast race for territorial control. Now even if your team has the lead early on, it's still a game of endurance, it's still League of Legends. The losing team can just as easily make a comeback. Getting greedy and trying to gun for the remaining capture points under enemy control is a surefire way to give the other team an opportunity for a comeback. For one, you're more than likely to get ganked, which puts you back 15 seconds and one champion less for them to deal with. All in all, it's a very intense experience and one that is just as addicting as the traditional game mode.